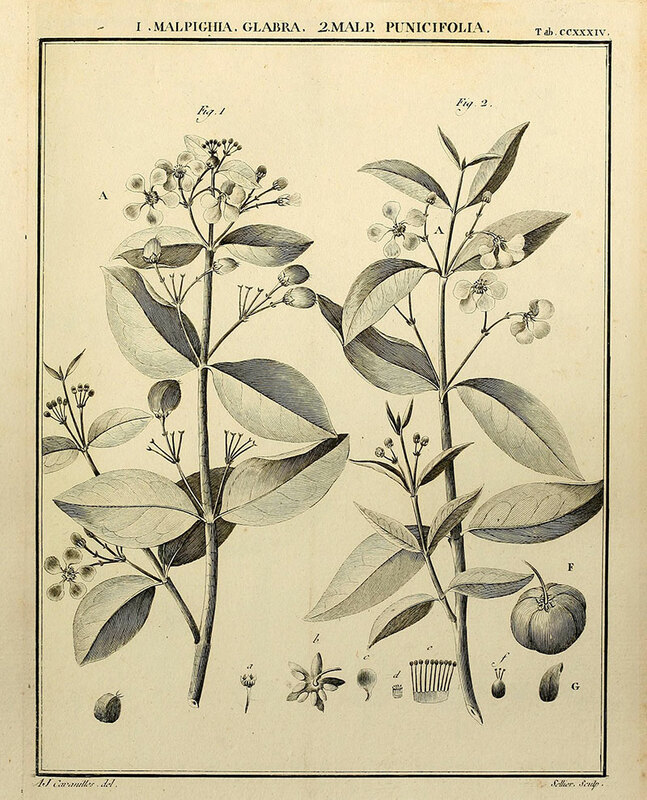 Monterey Bay Spice Co. - Acerola "Vitamin C"
Acerola, also known as wild crepe myrtle and West Indian cherry, is a shrub found throughout the Caribbean that also grows in Mexico and southern Texas. The plant produces bright red berries that are dried and powered as a supplement source of vitamin C.
Acerola is 3-6 ft. shrub-like perennial of the Malpighiaceae family, Acerola develops into a thick, rounded canopy of fairly delicate foliage. Small pink flowers appear periodically from April to October and are followed about one month later by bright red, tart-tasting, 1-inch fruits which are extremely high in vitamin C.
"Malpighia" is attributed to Italian physiologist, Marcello Malpighi (1628-94) and "glabra" from the latin for smooth, most likely in reference to the smooth fruit surface. Found in thickets, brushland, and palm groves from south Texas through Mexico, Central America, West Indies, and the Caribbean to South America as far as Peru and Brazil. Acerola can be classed as tropical and subtropical, and is naturally adapted to both medium and low-rainfall regions; can tolerate long periods of drought, though it may not fruit until the coming of rain. The tree does well on limestone, marl and clay, as long as it is well drained. The pH should be 5.5 to 6.5. Be sure to incorporate lime to avoid calcium deficiency — work the lime into the top 8 inches of soil. Seeds should be cleaned, dried, and dusted with a fungicide. It should also be noted that only seeds that come from a fully developed fruit will germinate well. Germination rates average around 50%, but can be much lower. Seedlings should be transferred from flats to containers when 2 to 3 inches high. 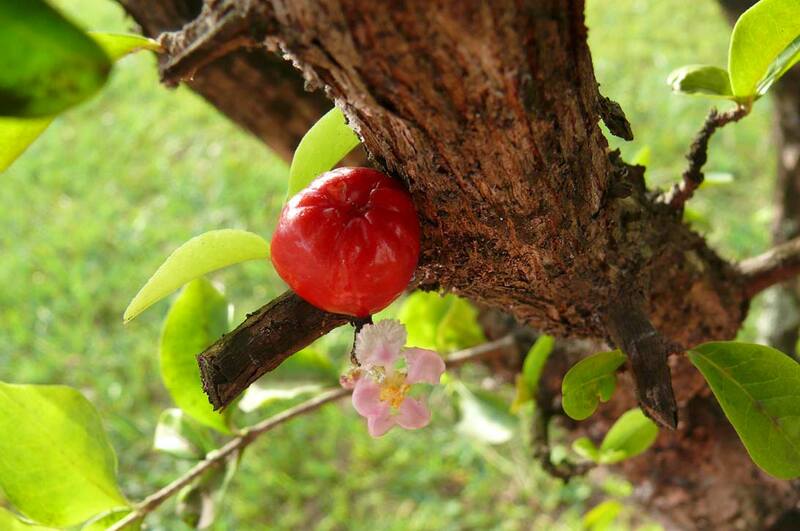 Acerola can also be propagated by air-laying or cuttings. Some plants will fruit as soon as a year after planting but a good crop cannot be expected until the 3rd or 4th year. The tree will continue bearing well for about 15 years. The time between flowering and ripened fruit is approximately 22 days. 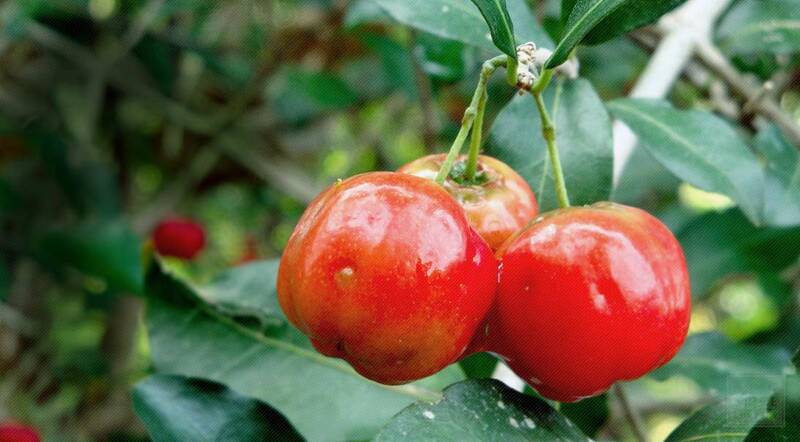 Acerola will grow and fruit fairly well with little care. For best performance, experts have recommended a fertilizer formula of 8-8-13 twice annually for the first 4 years. In Florida, the Bahamas, Puerto Rico and Hawaii the fruiting season varies with the weather. There may be a spring crop ripening in May and then successive small crops off and on until December, but sometimes, if spring rains are lacking, there may be no fruit at all until December and then a heavy crop. For home use, as dessert, the fruits are picked when fully ripe. For processing or preserving, they can be harvested just before ripe, when they are turning from yellow to red. As there is continuous fruiting over long periods, picking is done every day, every other day, or every 3 days to avoid loss by falling. The fruits are usually picked manually in the cool of the early morning, and must be handled with care. For immediate processing, some growers shake the tree and allow the ripe fruits to fall onto sheets spread on the ground. Harvested fruits should be kept in the shade and moved inside from the field within 3 hours to minimize the loss of ascorbic acid. Acerola fruit can be made into juice, syrup, puree, jam, jelly or similar forms. If the juice cannot be consumed fresh, it can be frozen for future use.